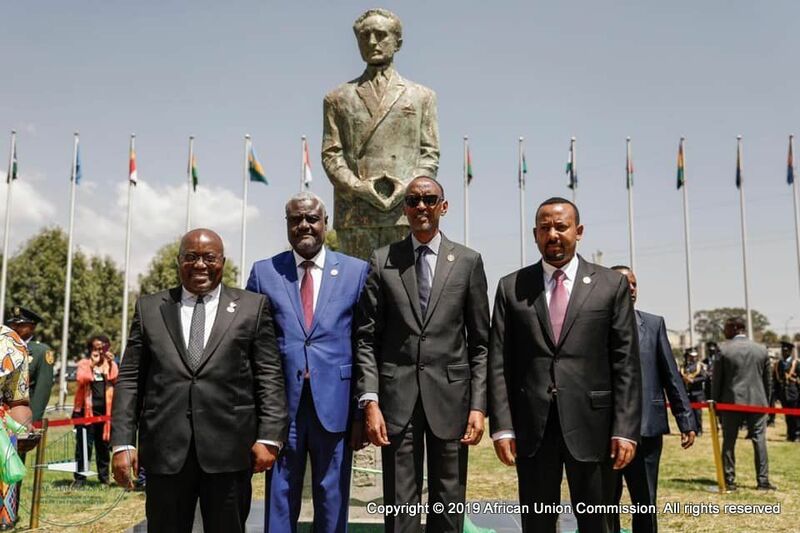 Addis Ababa, Febuary 10 2019: The African Union has unveiled the commemorative statue of Emperor Haile Selassie at the 32nd African Union Summit in Addisa Ababa on 10 February 2019 in Addis Ababa. The statue of Emperor is an important recognition to his effort towards Africa’s liberation and unity leading to the formation of the Organisation of African Unity (OAU) in 1963. The Former Ethiopian Leader and a Pan-Africanist statue is the second to be erected at the AU headquarter. In 2012, the statue of Ghanaian Pan-Africanist Kwame Nkrumah was unveiled during the inauguration of the new AU headquarters in Addis Ababa. The unveiling took place in the presence of the African Union Chairperson, H.E Moussa Faki, H.E. Nana Addo Akofo, H.E. Abiy Ahmed, Prime Minister of Ethiopia, H.E. Paul Kagame, President of Rwanda, and Mr. António Guterres, UN SG, the Imperial family, as well as representatives from His Imperial Majesty Haile Selassie I, Ethiopian World Federation, the Rastafari community and other invited guests.